Rosa is a new believer. Her husband and she just converted to Christ a few months ago. Her passion and love for the Lord is so noticeable; she never lets an opportunity pass by without talking to people about salvation. 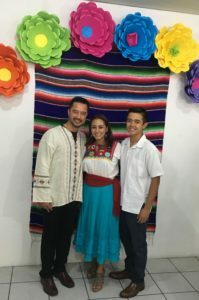 Rosa’s mother, being a very strong follower of the traditional religion and faithful follower of many idols, was very upset at Rosa for her decision to convert to Christ and so the mother also hated to even hear about our names (Edwin and Maria Giron). Of course, she blamed us for changing her daughter to “another religion” (that is how she said it). Suddenly, the Lord worked a wonderful miracle. Rosa has ten siblings and one of her brothers, Martin, came to Rosa asking for help. He was desperately deep in alcohol and depression. He told Rosa that he wanted the same happiness and the changes in marriage just like she was having. Rosa then invited Martin to our house for a Bible Study. That same night, Martin converted to Christ and from that day to now he has stopped drinking. We have seen his true transformation; he has a different face and different way to see life. Praise God! After seeing the changes on her daughter and now on her son’s life, Rosa’s mother asked Rosa if it was possible to bring us (missionaries) to her house to have Bible studies, so that she could gather her other sons and daughters together to hear about the Word of God too. The Mother wanted the rest of her family to have a transformation just like Rosa and Martin experienced. Praise the Lord! We were so amazed and happy to hear that the mother was now willing to host us in her house to introduce Jesus Christ to the whole family! We started three months ago and now there is a house church with a group of 18-20 people faithfully attending the meetings every week. Glory to God! What is happening in this family can only be possible because the Holy Spirit is working on these people’s hearts. Rosa’s mother is 83 years old; it is still a bit difficult for her to renounce her religion, but we trust that the Holy Spirit will touch her heart and revel the truth about Jesus as our only Lord and Savior. Please pray for this wonderful group. That we would see many become strong and committed disciples that will continue expanding God’s kingdom in Aguascalientes and beyond.